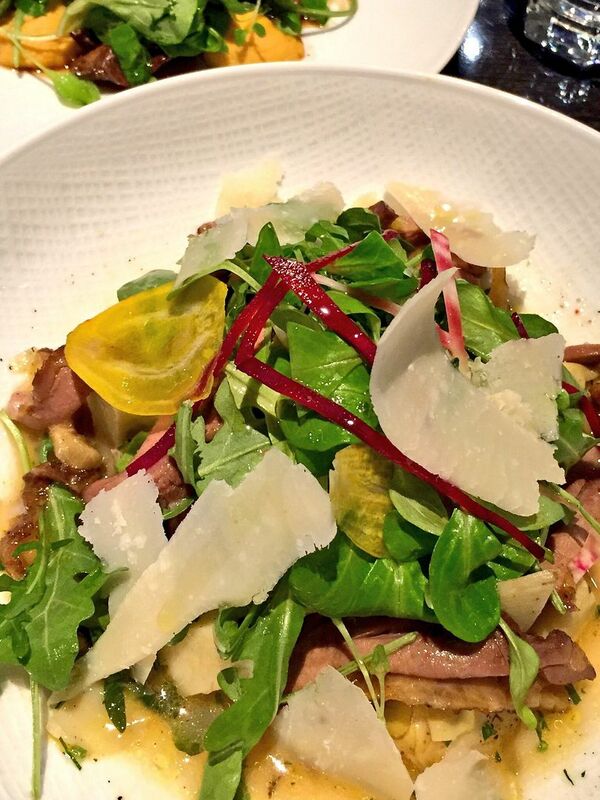 It’s the new “piatti unico “– a pairing, here linguine with clams beside baked clams, on a rectangular plate. 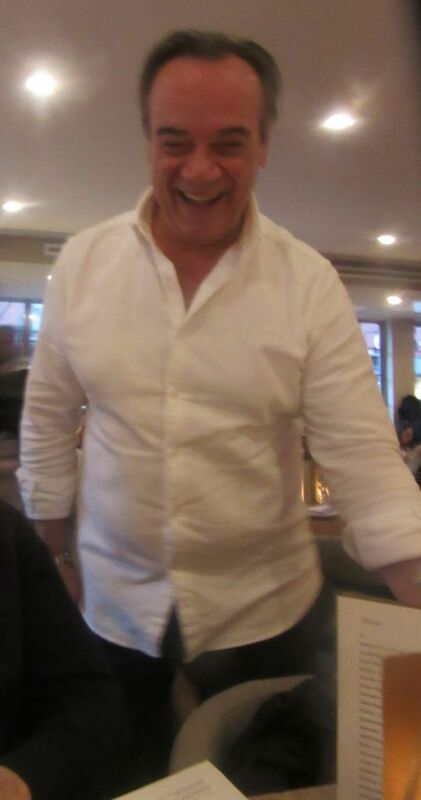 Seniors who followed Pino Luongo’s 35-year restaurant career from busboy to Il Cantinori to feeding titan to bankruptcy and modest rebirth at Morso are downtown tonight celebrating the humility of the new Coco Pazzo. 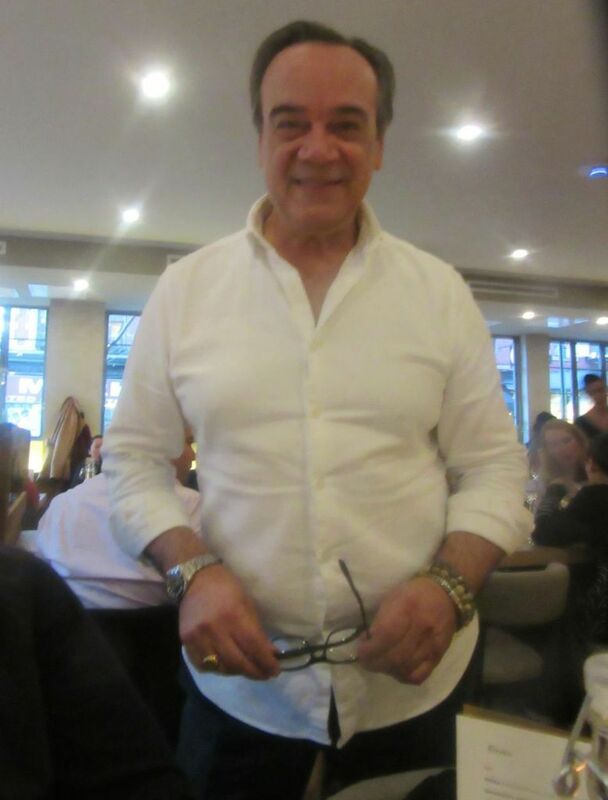 We’re packed into the modest Tribeca canteen and sandwich shop alongside clutches of youngsters from the neighborhood who probably never heard of The Dark Prince of Italian Dining. 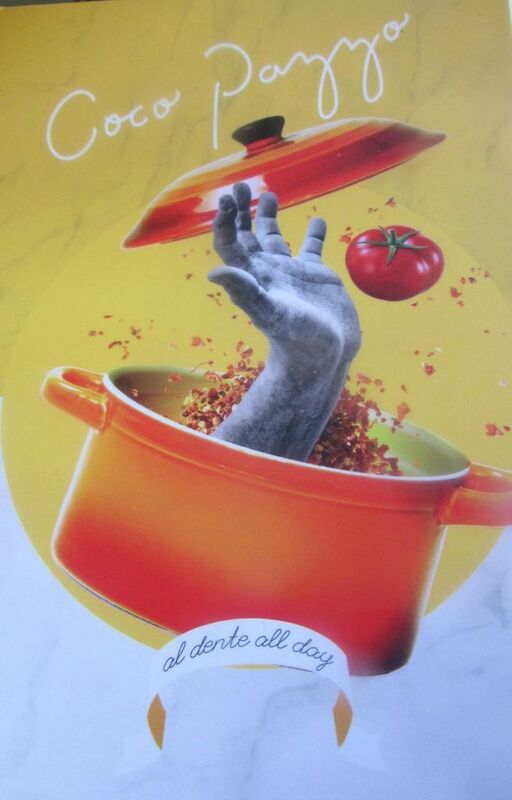 “Al dente all day” is the Coco Pazzo rallying cry. And sure enough the bucatini is perfect. By day it’s a sandwich shop that delivers in the neighborhood. “Al dente all day,” is the house motto. For those of us who remember the tantrums and feuds, the stumbles and successes, Coco Pazzo revisited, with its evolved, so gently solicitous host, will be a wonderful surprise. When a new spot is hot the waiter can condescend, but not here, we’re all family. It’s the modest spot you might stumble on in a back street of Rome. It feels like somebody’s grandmother is in the kitchen. The ingredients are market fresh and not too fussed over. Sandwiches at lunch. More complexity at dinner. 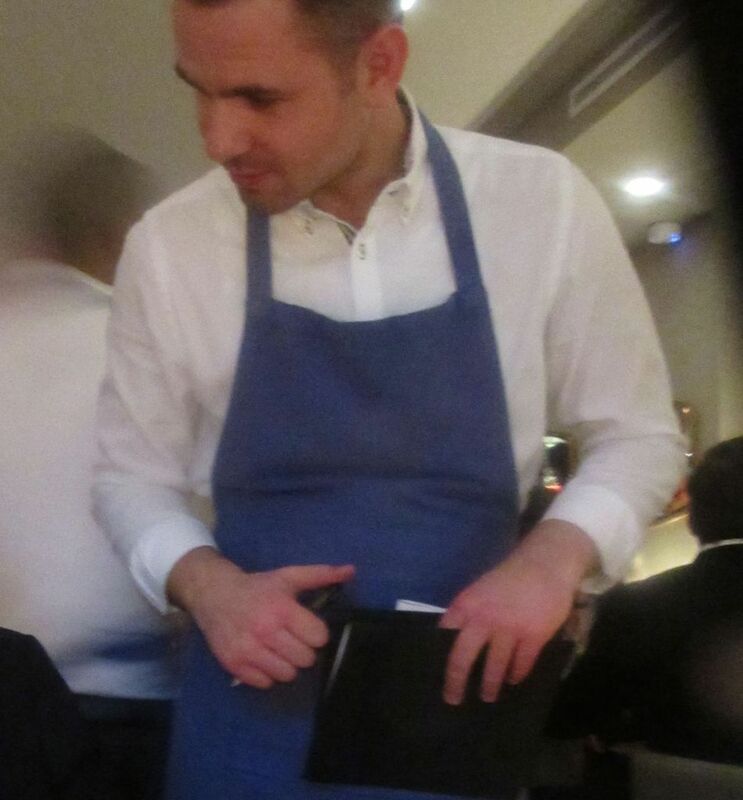 The waiters in their navy aprons are like family. And you might easily end up spending less than $55 for dinner even if you order a well-made mescal cocktail, a glass of red, and choose to linger over the best cheesecake in town. 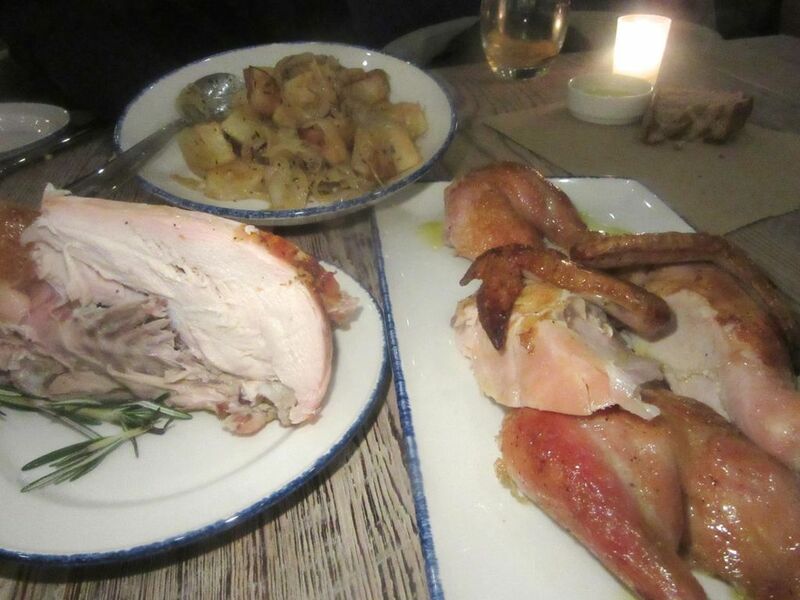 The whole three-pound chicken stops by the table for our admiration than is whisked away to be carved. The busser drops off a platter of juicy bird parts in crackling skin but we demand to keep the carcass too. 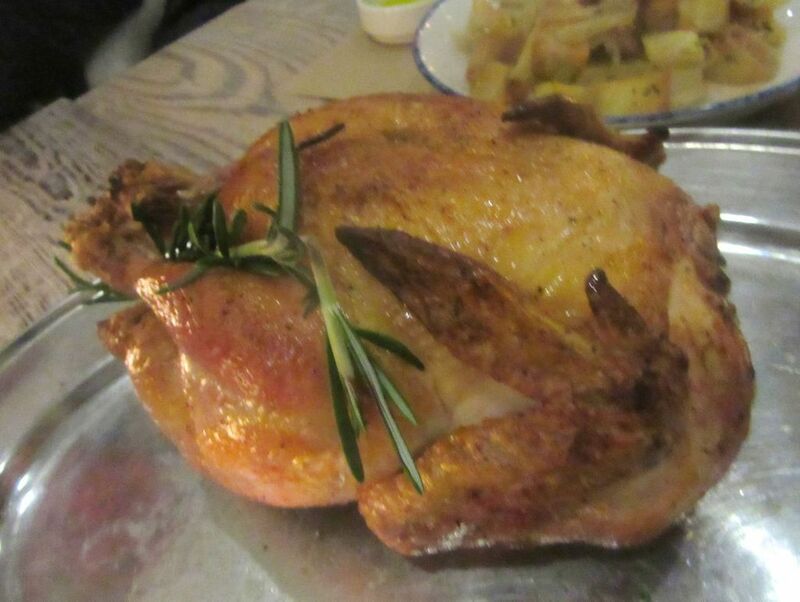 The burnished bird is presented for our admiration, then snatched away to be carved in half a dozen pieces. I watch the residual carcass about to be rushed away. Presumably it will get tossed into a cauldron to become brodo served as a $9 zuppe with pastina and sautéed chicken livers. 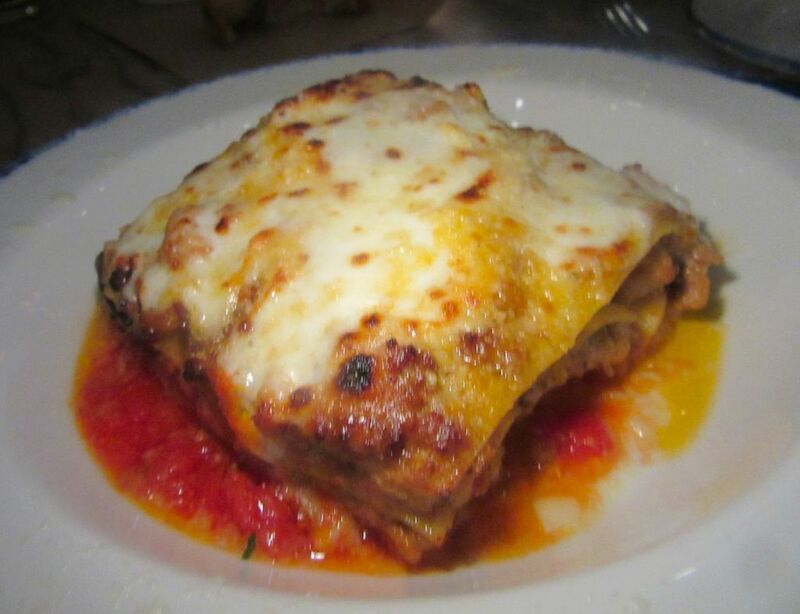 Pasta from the oven includes this lasagna alla Bolognese divided for the table to share. 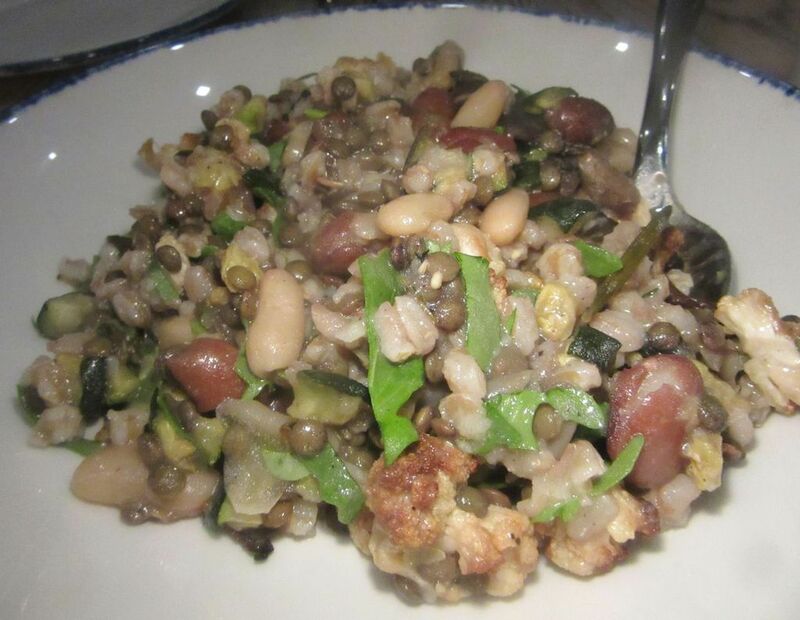 Farro is tossed with lentils, chickpeas, mushrooms, zucchini cauliflower and cannellini beans. But we’re not letting our carcass disappear. We insist it be placed on the table so we can scavenge choice bits of crispy skin and clinging breast meat. If everyone ordering the bird were as demanding, it could sabotage the chicken soup production. 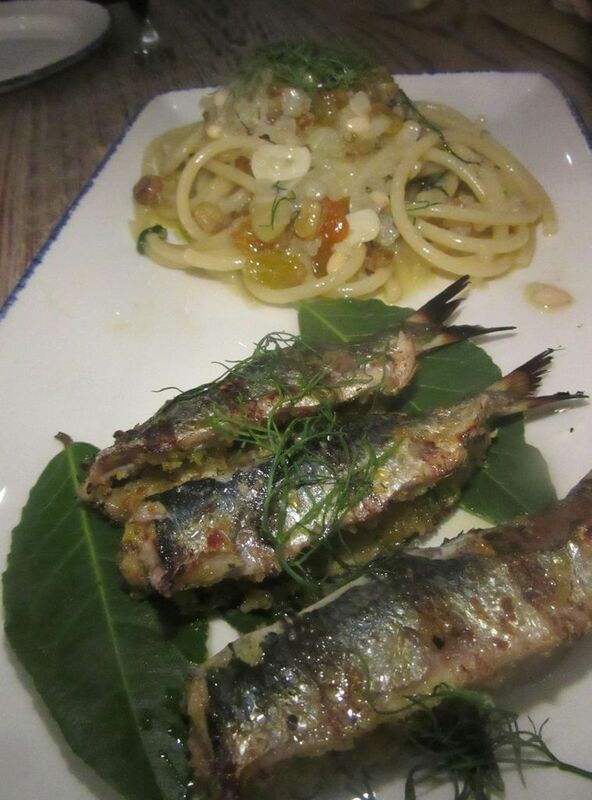 Sicilian-style bucatini is paired with pistachio-stuffed, grilled sardines in a piatti unico. The three of us have already shared lasagna Bolognese, bucatini with stuffed sardines, and the grain insalata to start – a toss of farro, lentils and chickpeas with chunks of mushroom, zucchini, cauliflower and cannellini beans. A juicy thigh is all I can put away. 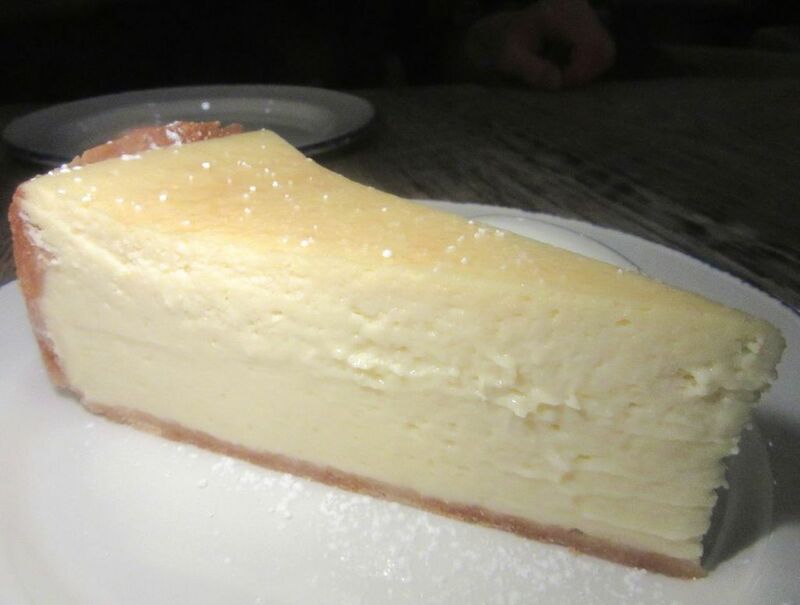 It’s difficult to imagine a corner of the tiny kitchen turning out this delicate cheesecake. Maybe its store-bought. 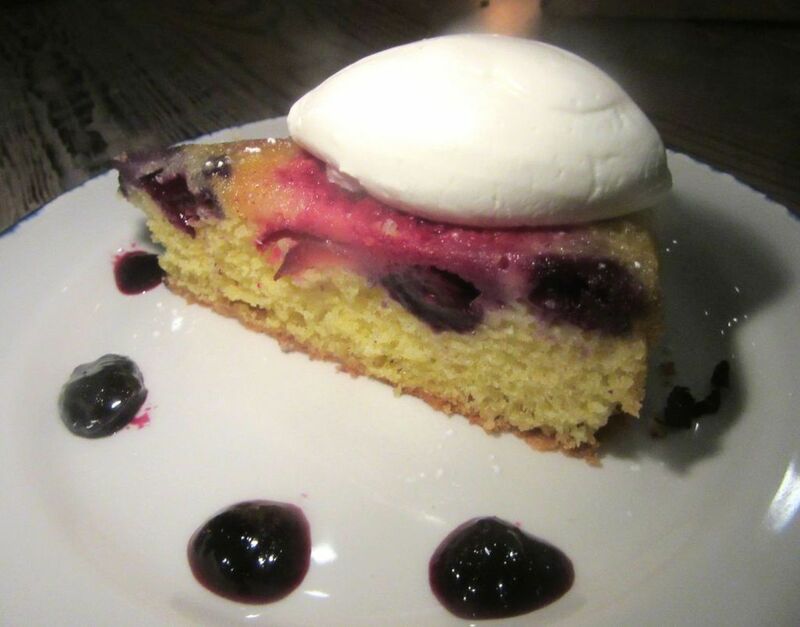 The cherry-plum polenta cake definitely tastes homemade by an Italian grandmother. Too full, we unanimously decline dessert, but my appetite revives with one forkful of the creamy and ethereal cheesecake our host has sent as a gift along with plum-cherry polenta cake. As we head toward the cluster of late-night diners waiting at the door, we pass the carving stand. There’s a giant rib eye steak waiting to be sliced. “I have to get to work on that,” Pino Luongo says, presenting his cheeks to graze and shaking hands all around. If Luongo never betrayed or punched you, you might be pleased to see him laughing again. Yes, that same Pino. Today’s youngish foodies may never have heard of him. But if you’re old enough, you probably followed him, too. 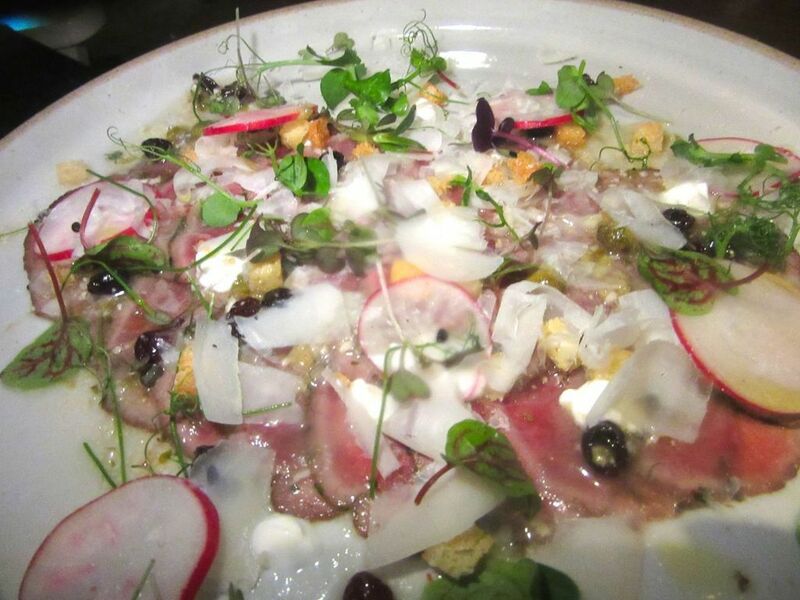 Sapore di Mare in East Hampton and on St. Bart’s. The parade of women chefs at Le Madri in Chelsea. His run with the Pressmans at Barney’s. Mad.61. Coco Pazzo as a power scene uptown and in Chicago. Tuscan Square selling placemats and crockery as well as pasta in Rockefeller Center in 1997. Centolire on upper Madison before the feds locked the door for unpaid taxes. “The Dark Prince of Italian Dining” has found light on the corner of :Prince and Thompson Street. He never insulted me (to my face) or fueled his career with my money to finance a hopeless dream. So I’m pleased to find him standing again, snatching off his black-rimmed bifocals the better to pose for my photo, not too big to further his comeback in this welterweight ring. Crowded into the small room are older Coco Pazzo fans and younglings who never heard of Coco Pazzo before. Our host sends us the house selection of cured meats and cheeses with house-pickled vegetables. 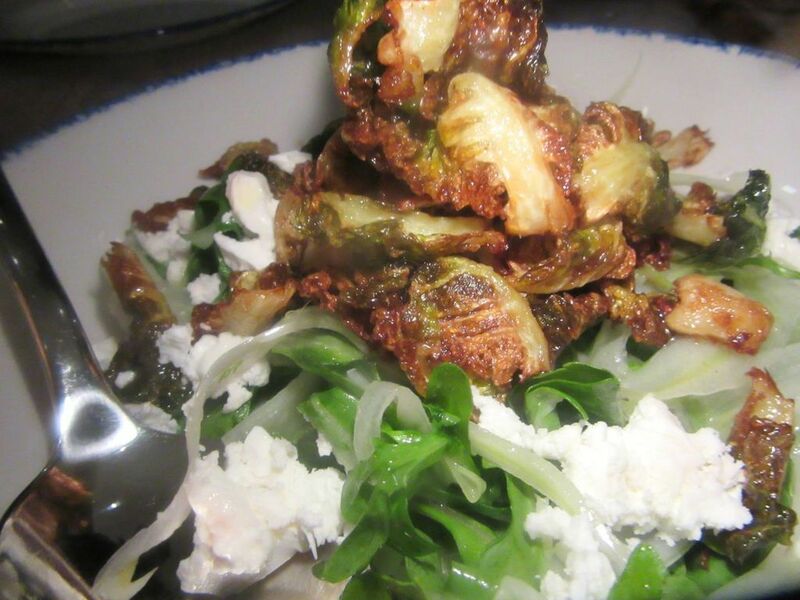 Crispy leaves of Brussels sprouts tossed with fennel, Greek feta and arugula is a fine salad starter. I ask her to reserve for us. 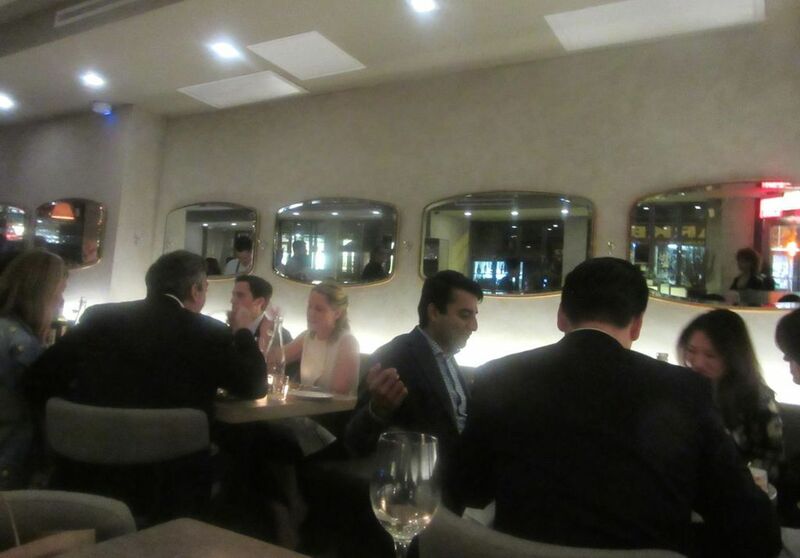 The place is already so sought after, she can only score a table at 5:30 or 10, she reports. Annoyed, I decide to forgo anonymity and call Pino on his cell. “Whatever time you want,” he says. Reassuring, but annoying, if you know what I mean. 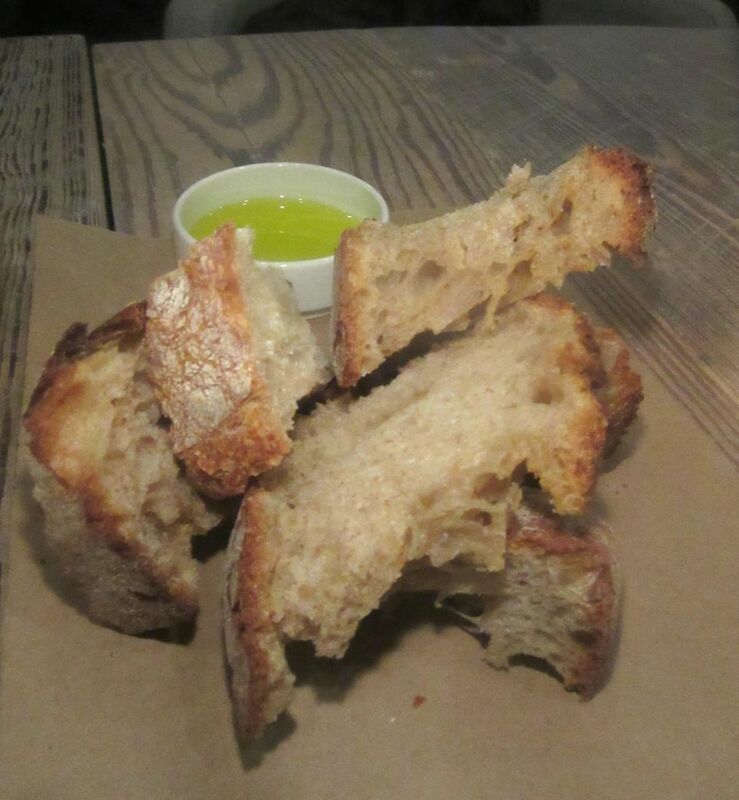 The bread wrangler drops slices of rustic crusts and a dish of olive oil at the table on a piece of brown paper. 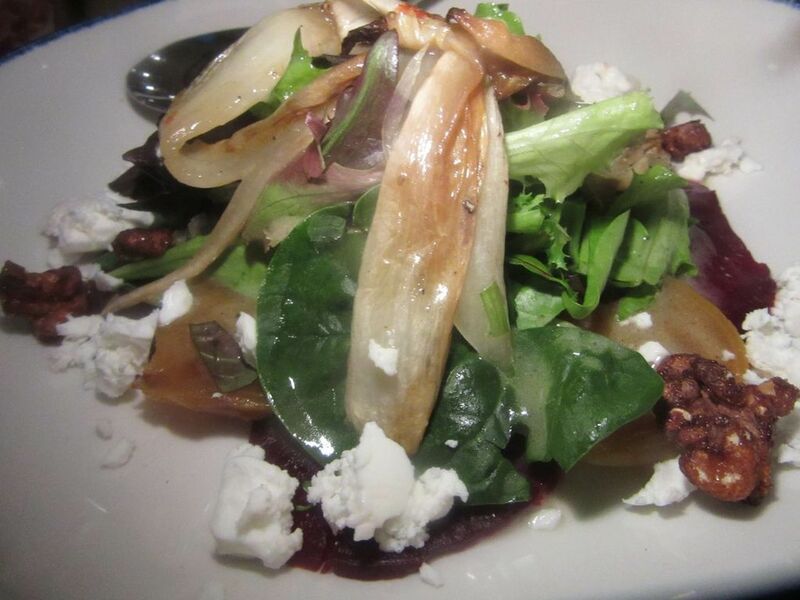 Red and gold beets are tossed with feta, roasted endive and toasted walnuts in the barbietole insalata. 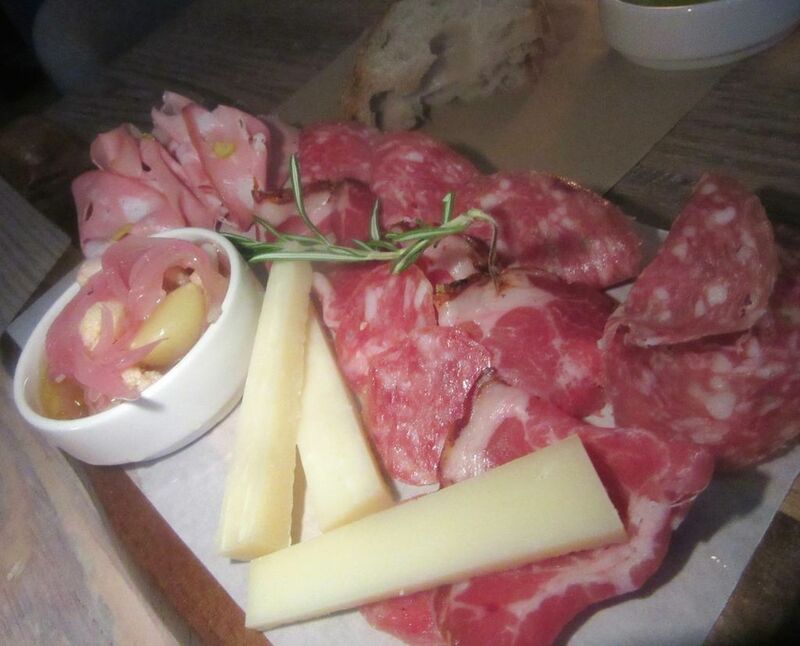 That first night Luongo sends the house selection of cured meats and cheese with house-pickled vegetables as a gift to our bare wood plank table. It arrives after we’ve already chosen starters and after the bread wrangler sets down a saucer of olive oil and several slices of rustic bread on a piece of brown paper. 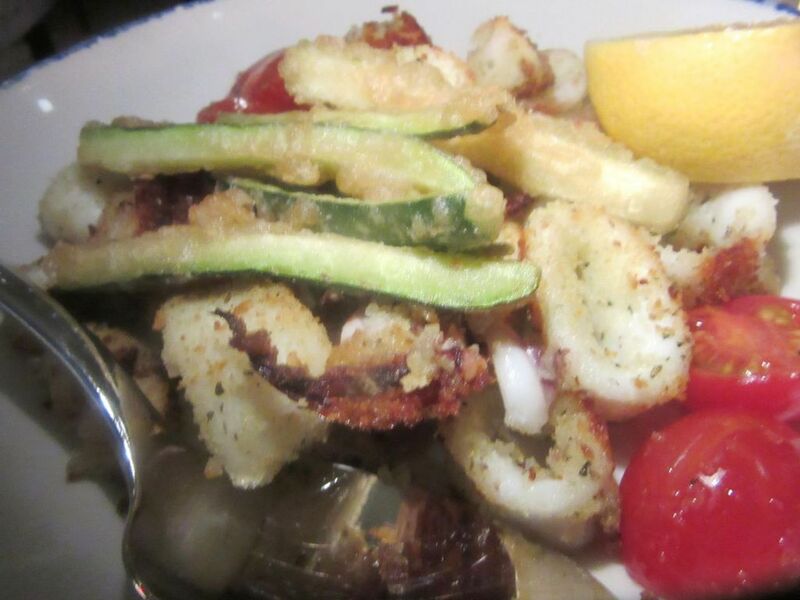 Crumbed and oven-roasted calamari and zucchini taste slightly tired on my this first visit. The fried calamari and zucchini taste fried too far ahead. But the salads are good enough: crispy Brussels sprouts with fennel, feta and arugula, and a toss of beets with toasted walnuts, roasted endive and more feta. But after too much of everything, and the charcuterie platter (the piccolo is $18, the grande $26), I can barely manage to put away a few forkfuls of my excellent macaroni gratin. 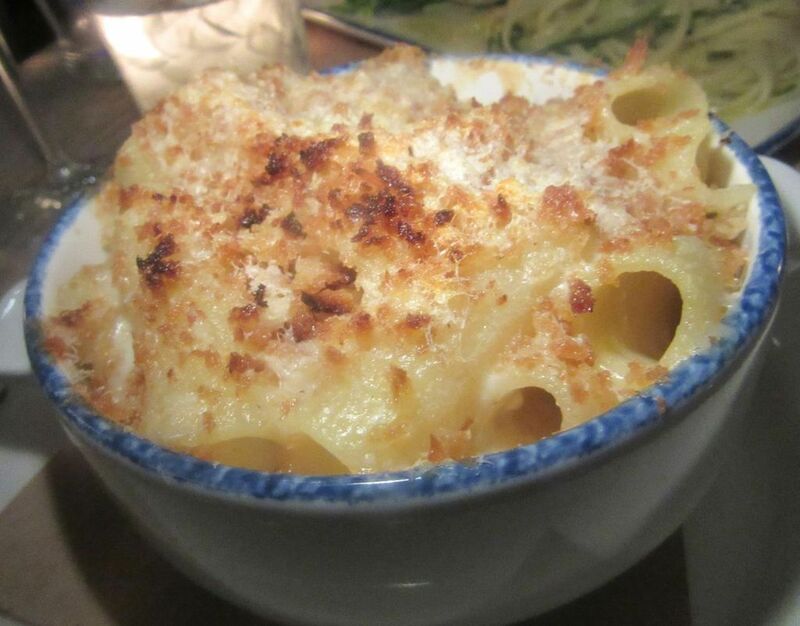 It’s impossible to finish the baked maccheroni gratin with four cheeses. It’s wonderfully rich and I’m too full. 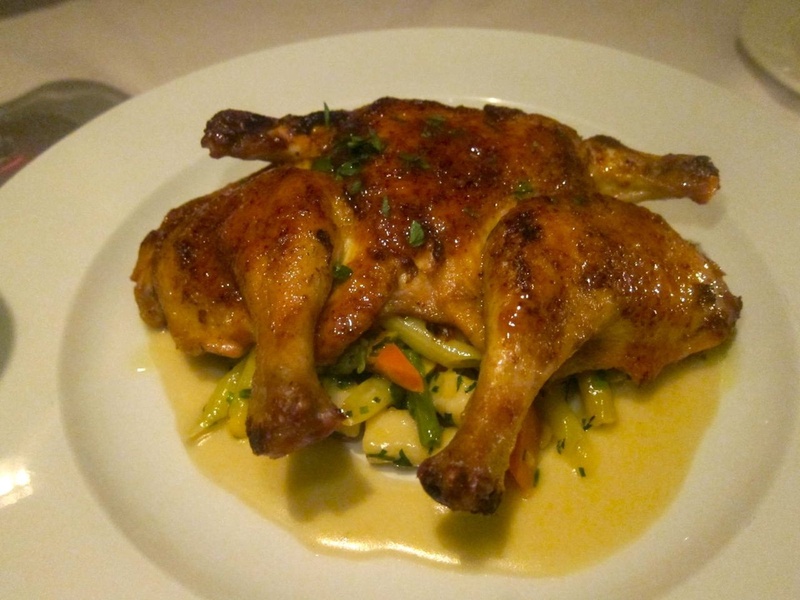 One of my companions chooses the evening special “piatto unico,” Luongo’s invention, “a complete dinner in a rectangular dish” ($18 to $26.). It might be lobster-studded spaghetti paired with half a lobster diavolo, or pappardelle with beef stracotto and braised brisket. But she’s also eaten too much already, and barely touches her kale-pesto linguine served alongside a large portion of eggplant Parmigiana in an oozing coverlet of cheese. 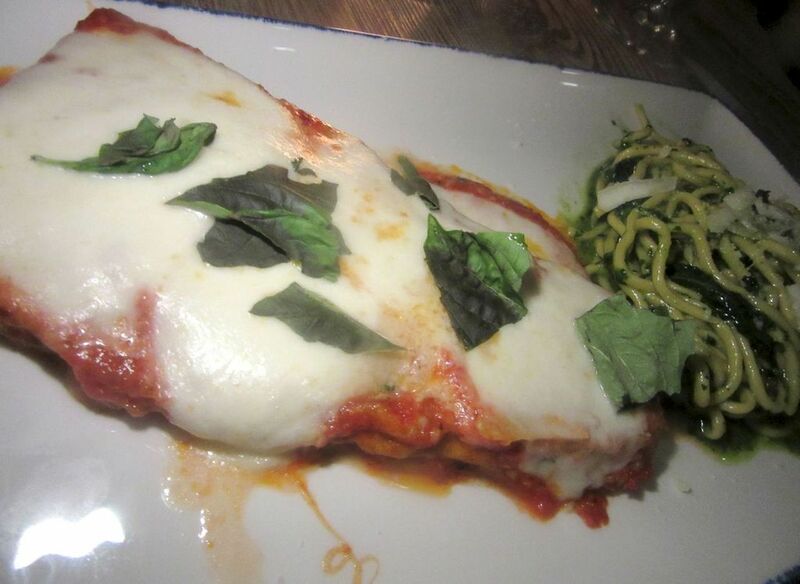 One evening’s special piatto unico is eggplant Parmigiana alongside a hill of kale pesto linguine. 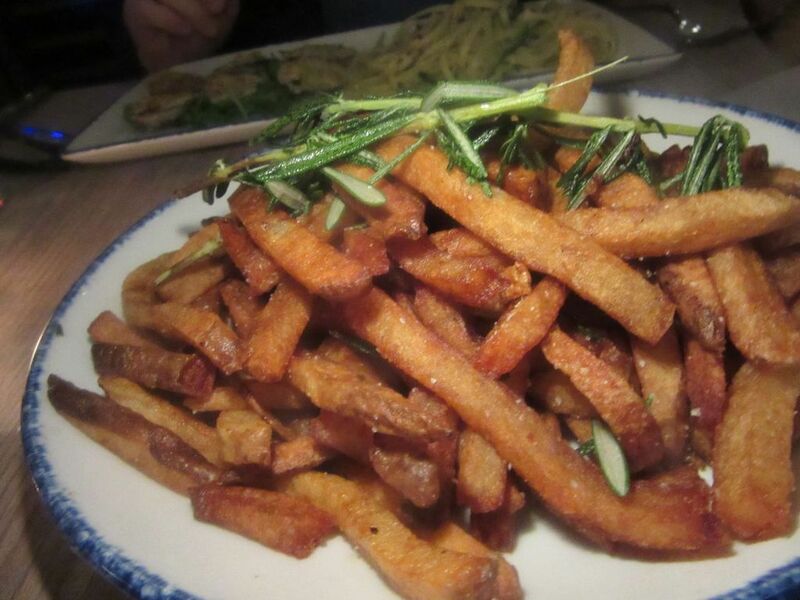 Did we need Tuscan fries to? Certainly not. But these were crisp and brown and delicious. Her husband does better with his rectangle: clam linguine in a swirled nest next to half a dozen stuffed clams oreganate. I taste everything because that’s my job, and it’s all quite delicious. They offer to order dessert so I can write a review. “I’ll taste desserts next time,” I propose. 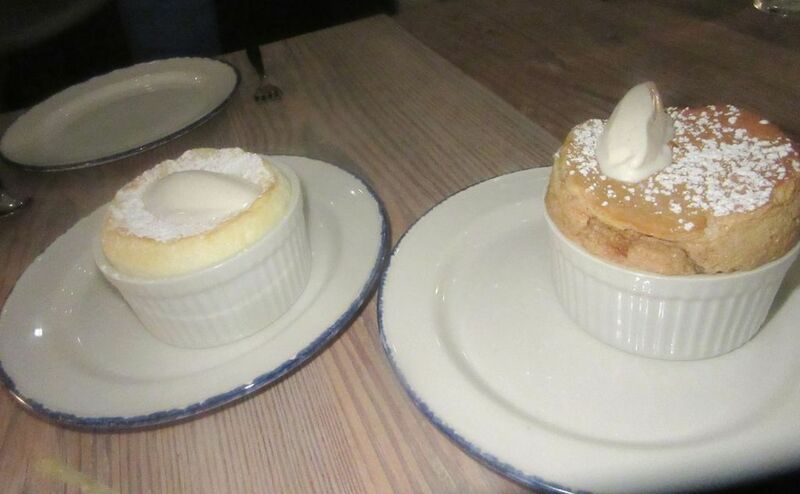 These small soufflés are tangerine and mocha and not very thrilling. But it seems our dessert has already been ordered. This probably won’t happen to you unless you’ve been recognized as one of the faithful at the old Coco Pazzo. We are not much impressed by the duo of small soufflés, chocolate and tangerine, sadly wimpy. But that’s okay. I loved everything else. And I’ll be back. 160 Prince Street. SE corner of Thompson. 917 518 0162. 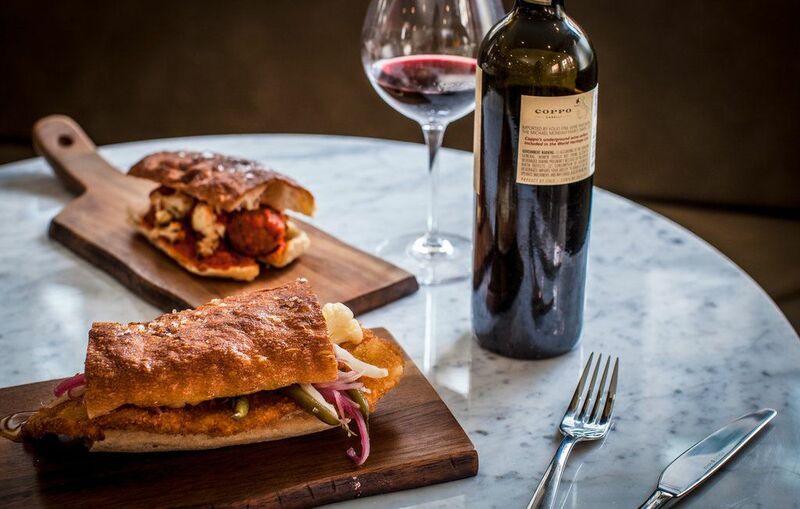 Lunch Monday through Friday 11 am to 4 pm. Dinner daily 5 pm to 11 pm. Brunch Saturday and Sunday 11 am to 4 pm.